KUALA LUMPUR: SP Setia Bhd is considering the possibility of venturing into Singapore's property market soon, says its president and chief executive Tan Sri Liew Kee Sin. 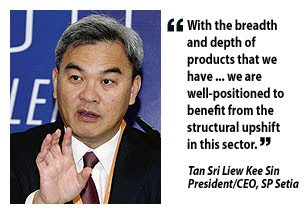 "With the breadth and depth of products that we have to offer, from townships to luxury homes and integrated commercial developments, we are well-positioned to benefit from the structural upshift in this sector," Liew told newsmen at invest Malaysia 2011 here yesterday. The property developer is also on track to achieve its targeted RM3 billion sales this year from RM2.3 billion in 2010, backed by new project launches and the growing property market. SP Setia's sales for the first five months of the financial year hit RM1.21 billion as at March 31. Liew said the strong impetus provided by the government's Economic Transformation Plan, a young demographic with more people entering the house-buying age, growing income levels and a supportive banking sector augur well for the domestic property sector. He said the group is confident that prospects for the Malaysian property market will remain robust. "The growing confidence in the country's private sector, together with the government's stimulus, is boosting the property market," he said. He said over the last eight months, the group has been steadily increasing its landbank in Johor and Klang Valley. Liew said SP Setia's current active projects, including that in Penang, have a remaining gross development value (GDV) of about RM19 billion. With the upcoming launch of its KL Eco City and Setia City, which have GDV of RM6 billion and RM10 billion respectively, coupled with three new projects in Klang Valley and Johor Baru with total GDV of RM5.5 billion, the group's project pipeline has increased to RM40.5 billion. SP Setia, which has a current market capital of RM7.5 billion, expects to launch its venture in Melbourne, Australia, called Fulton Lane, a A$450 million (RM1.4 billion) high-rise residential development within two months. KUALA LUMPUR: SP SETIA BHD plans to undertake a multi-storey residential apartment building at Woodsville Close in Singapore with an estimated gross development value of S$130 million. The company said on Thursday, April 14 its subsidiary SP Setia International (S) Pte Ltd had signed a sale and purchase agreement with 27 strata units’ subsidiary proprietors at Leong Bee Court. The acquisition would include the strata units and common property on a 0.68 acre site for S$65 million or RM159 million. “The land is square shaped with a flat terrain which makes re-development potential very attractive. The purchaser proposes to undertake a re-development of the said land into a multi-storey residential apartment building. “Based on the preliminary feasibility study and subject to the approvals of the relevant authorities, the proposed project is expected to have an estimated GDV of approximately S$130 million or approximately RM318 million,” it said. The concept of The Elements project is to cater for young urbanites looking for a sanctuary within the city. PETALING JAYA: Land & General Bhd (L&G), a property developer, expects to remain profitable in the current financial year, helped by its newly-launched joint venture project, called The Elements in Ampang. The firm has projects with a gross development value of about RM700 million. The property developer posted a net profit of RM29.54 million in the financial year ended March 31 2010, nearly double the RM15.31 million net profit it posted in the previous corresponding period. Up to the nine months ended December 31 2010, the company's net profit stood at RM13.4 million. "We expect our ongoing commercial project, 8trium in Bandar Sri Damansara to help improve profits for the next three years," executive director Ferdaus Mahmood told Business Times after the company's extraordinary general meeting (EGM) in Bandar Sri Damansara yesterday. At the EGM yesterday shareholders voted on a plan to buy 10 parcels of land with a 27 hole golf house in Negri Sembilan for RM25 million. "Apart from the golf course we will develop it into residential project," he said, adding that the company will use internally generated funds to acquire the assets. Meanwhile, speaking on its newly launched project - The Elements, Ferdaus said that the project is a joint venture with Malaysia Land Properties Sdn Bhd. The project features some 1,000 units of high-end studios, one- and two-bedroom condominiums, as well as lifestyle and retail components. The 8trium comprises a two-storey 100,000 sq ft retail podium and 260 units of office suites contained in two blocks. Kuala Lumpur: Some 1,214ha of rubber land in Sungei Buloh, Selangor, has been alienated to the Employees Provident Fund (EPF), Malaysian Resources Corporation Bhd (MRCB)'s chief executive officer Datuk Mohamed Razeek Hussain told fund managers and analysts at the Invest Malaysia 2011 yesterday. "Our chairman Tan Sri Azlan Zainol, who is also EPF's chief executive officer, told MRCB shareholders last week that the Sg Buloh land has already been alienated to the pension fund," Mohamed Razeek was quoted as saying by a fund manager who attended the briefing. The land is currently owned by the Malaysian Rubber Board. Mohamed Razeek said MRCB, which is 40 per cent controlled by the EPF, is set to be an active participant in the project. "Mohamed Razeek said that since MRCB is 40 per cent controlled by EPF, MRCB can be expected to be active in the Sg Buloh redevelopment," a fund manager who did not want to be identified told Business Times after the closed-door presentation. MRCB also plans for a mixed-development on 27.41 acres with gross development value (GDV) of RM1.5 billion in Setapak, Kuala Lumpur. At a total development cost of RM1.2 billion, the expected profits to be derived from the said development amount to about RM300 million, representing 20 per cent of the GDV. The land will be developed from 2012 over an eight year period into a mixed-development comprising both commercial and residential properties with an estimated GDV of about RM1.5 billion. MRCB derives recurring income from leasing out some of its properties and collecting tolls from its Duta Ulu Kelang Expressway in Klang Valley and the Eastern Dispersal Link in Johor that connects to the North-South Expressway. "Going forward, Mohamed Razeek also said the group is hopeful that its recurring income from building leases and tolled roads would make up 35 per cent of group revenue," the fund manager said. Apart from property development, MRCB also bids for construction work. Currently, the group's order book totals RM1.6 billion and this will ensure sustained income for another 30 months.